Los Gatos, San Jose, Silicon Valley real estate & homes for sale. In depth local market info from nationally recognized top Realtor & blogger Mary Pope-Handy, representing home sellers and home buyers throughout Santa Clara County. This website is here to help. Professional philosophy for this website, popehandy.com: Buyers and sellers of Silicon Valley real estate & homes for sale want solid information that they can use to enable them to make good decisions regarding the sale or purchase of a property. This website is designed to assist you to learn about the local Santa Clara County residential real estate market, home types, neighborhoods & subdivisions, the process of buying & selling and more, whether you live here now or are relocating to the Los Gatos, Saratoga, San Jose area or elsewhere in the region. There are literally hundreds of pages of information on this website especially geared to be a comprehensive resource for Silicon Valley home buyers and sellers – and home owners who want to stay put, too. Many internet-savvy buyers and sellers begin their Silicon Valley real estate education on the web 18 months or more before they are ready to buy or sell. Most don’t really want to talk to a Realtor too early on and would prefer to investigate alone & anonymously. You will find plenty of reading on this site as well as my others (please see list of my other blogs and websites at the bottom of each page). There are also multiple ways you can view listed homes for sale. The simplest way is to search listed homes by map. (Or you can browse the map of Silicon Valley homes for sale below!) There’s no forced registration for reports or to browse the housing inventory. If you want to save a search and come back to it later, you can register – but you aren’t made to do that. Sorting out neighborhoods? We’ve got that covered – just check under Communities in the menu bar. Since this site is for Silicon Valley generally, includes are real estate and homes in San Mateo County, Santa Clara County, Santa Cruz County, and a little of Alameda County. If you are seeking real estate market statistics, you’ll find them on this site and also at my Real Estate Report for Santa Clara County, San Mateo County, and Santa Cruz County. But don’t feel like you have to go it alone. While the internet is a great source of information, it cannot guide you or interpret the data on your behalf. If you are looking to buy a home or sell a home in San Jose, Los Gatos, Saratoga, Monte Sereno, Campbell, San Jose’s Cambrian Park or Almaden Valley (to name but a few), please contact me. I’m a full time, experienced, top producing Silicon Valley real estate agent (since 1993), am a second generation Realtor and Santa Clara County native. I work with people buying & selling everything from luxurious estate properties to condos or lofts throughout the county. Even if you think it’s early in the process to ask questions, please feel free to contact me. I respect your privacy, am not pushy, and would welcome the chance to assist you so that when you’re ready, I’ll be your Realtor of choice and to help you to sell or buy a home here in Silicon Valley, “The Valley of Heart’s Delight”. On my YouTube Channel, you’ll find a Los Gatos videos and number of real estate and neighborhood films for Saratoga, San Jose, Silicon Valley, and California. There are some of me on camera, offering some real estate advice to home buyers and sellers. Below, get a sampling of one playlist on Los Gatos neighborhoods, parks, downtown, and more. They are in some cases “rough” as I am not a professional videographer, but they will give you a good sense of this beautiful town and the many different and unique neighborhoods & architecture found here! In other words, it’s a good intro to Los Gatos real estate, especially! Click on the menu icon in the upper left corner to see what’s on the playlist or to view a particular neighborhood’s video. 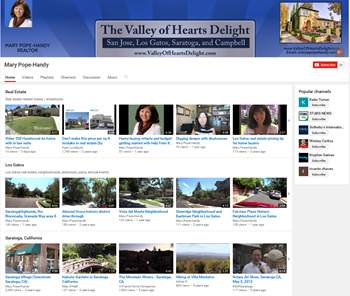 Please check out the channel at https://www.youtube.com/PopeHandy/ to learn more about Silicon Valley real estate, Saratoga CA, San Jose and the Santa Clara County area generally. You can also see some of my sold listings, but the focus is really not on my inventory, so that has not been a big priority. What else? You’ll also find videos “just for fun” on California Missions, Haunted Real Estate, and local history, “The Valley of Heart’s Delight” too. Silicon Valley offers a proliferation of high end cities, towns and neighborhoods with remarkable luxury properties and estate homes. These are not just homes with large price tags, but rather real estate with superior qualities and amenities not seen in regular homes. While in much of the U.S. a million dollars will buy a home worthy of the word “estate”, that is not the case in Santa Clara County, San Mateo County, or anywhere in Silicon Valley. Where are the high end homes found? This is one of the softest parts of the Silicon Valley real estate market as of late 2016 – many home buyers who can afford a large, luxury property do not want to over-invest in their personal residence, so are scaling back. For the home buyer looking to purchase a large home on a large lot, this is a great time to make an offer, as there is less competition than usual in the luxury or estate tier of real estate in Silicon Valley. When is an expensive property an estate or luxury home? Many nation-wide websites would have you believe that you can understand the Silicon Valley real estate market by simply plotting trends by city, zip code, or by tracking sales activity within 1 mile of any given property. While this qualifies as a popular and an easy answer, it’s not a very good one and usually provides far from accurate results. The reason for this is that we don’t have just one real estate market, but many micro markets instead. Silicon Valley is a large region. It covers all of Santa Clara County, most of San Mateo County, and parts of Alameda and Santa Cruz Counties. Within each county there are vast differences, of course, but sometimes those vast differences occur even within one zip code or smaller area. Sometimes even within one block! I sold a Monte Sereno home that had Campbell schools, while directly across the same street there was a house within the Los Gatos school system. Those are different markets. 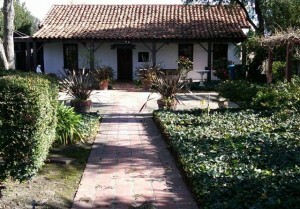 For example, the photo to the right is of a historic ranch style home made of adobe in the city of Santa Clara. One micro market may simply be “Historic homes in Santa Clara”. But another could be “Adobe houses in Santa Clara County” – since there are only a handful of them in our area, there won’t be enough old adobe ranch houses to compare just within that city. But what you would not do is compare this house to one on the same block which is a 1965 ranch style home made of wood. It’s only a little bit helpful that they are close together in location. The probable buyer for either house is most likely to be quite different from one to the next. Historic and adobe homes are both micro markets. Perplexing to many newcomers is the odd way that our school districts relate to zip code and city boundaries. Schools are very often – but not always – a major driver in home values. If you want to buy a home in Los Gatos, you could find yourself in the Union School District, the Campbell School District, the Los Gatos Union School District – and that is only in zip codes 95030 and 95032! Should you buy in the Los Gatos Mountains, which have a Los Gatos mailing address, you’d be in the Lakeside Union School District or possibly the Loma Prieta School District, unless you are very “close in” and still in the Los Gatos Union School District. (Many people moving here expect all homes in Los Gatos to have “Los Gatos Schools”.) Sometimes, most of one school district covers one zip code, but a sliver or smaller area may have a different district. That’s a micro market and is important to factor that in.